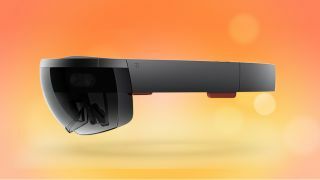 Microsoft has unveiled a holographic viewing headset, a unique spin in the growing world of VR and AR wearables. It is more minimal and lighter looking than Oculus Rift. The lenses are see-through, so users can see holographic projections in a real-world setting. The headset features spatial sound, so even holographs behind users can be heard. Advanced sensors pick up information from the surrounding world. The HoloLens includes a CPU and GPU as well as a third processor, one Microsoft invented and is calling a holographic processing unit. The HoloLens is also wireless, meaning users can move and interact untethered in the world around them as they simultaneously view and interact with projections. It also doesn't need a PC connection or phone to operate. Microsoft worked on HoloLens for years, Microsoft's Alex Kipman said, and the headset will release in the Windows 10 timeframe. HoloLens is the hardware part of a new AR computing initiative Microsoft is undertaking with Windows 10. Windows Holographic is designed to build the digital world into the users' real worlds, Kipman said, delivering new ways to work, game and interact with people and objects around them. Holographic Skype, Minecraft and a NASA Mars walking application are on demo at Microsoft's Windows 10 event in Redmond, a tasting menu of what's to come with HoloLens. A service called Holo Studios lets HoloLens users create 3D objects, moving and manipulating projected images in space. These creations can then be 3D printed, a function creatives and makers will likely lap up. The question, of course, is how much the headset will cost. Battery life is another concern. Microsoft was short on specifics for HoloLens, but we will get a chance to play with the headset later on today.